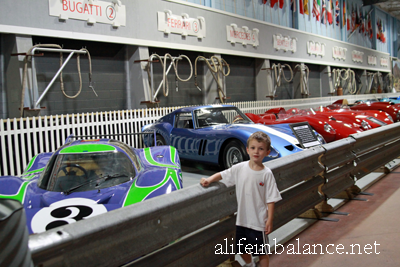 From the first race cars in America to the only true American race car to win a race, decades of race car history surround you at the Simeone Automotive Museum located in Southwest Philly. These unrestored cars may not be pretty though enthusiasts will find much to appreciate in their battle scars. 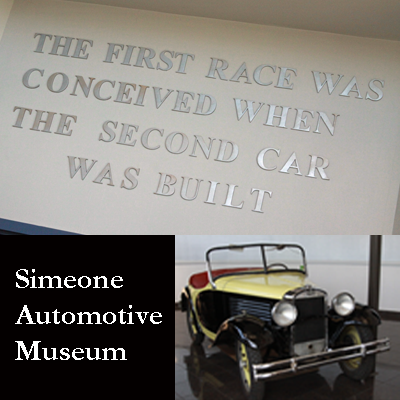 As the sign at the museum’s front entrance states, the first race was conceived when the second car was built. 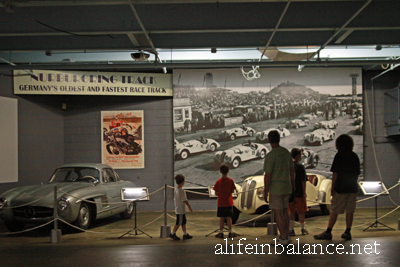 The ability to endure long distances played a significant part of early race car history. Surprisingly our local Fairmount Park hosted races before World War I. Featured here is the 1909 American Underslung with a chassis under the front axles, and 40 inch wheels to ensure clearance on rough roads. 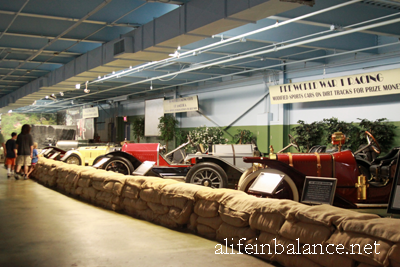 Yes, these cars were on the road long before our national highway system was in place. Pre-World War I racing in America saw stripped down sports cars in venues like Santa Monica, CA, Savannah, GA, Elgin, IL, and Long Island, NY. Our local Fairmount Park races could draw as many as 400,000 spectators. Between the wars, the Automobile Racing Club of America (ARCA) tried to organize sports car racing based on the European model though organized sports car racing did not take off again in America until after World War II. The 1955 Mercedes-Benz Gullwing drew a lot of attention from the men in my family despite several cars which had raced on the Bonneville Salt Flats being near by including a 1964 Cobra Daytona Coupe. Along one side of the museum you’ll find 40 years of Le Mans 24 hour racing from the 1933 Alfa Romeo 8C to the 1970 Porsche 917LH. Did you know that 2 to 4 drivers drove each car during the 24 hour endurance race? Only a few American cars seriously competed at Le Mans. 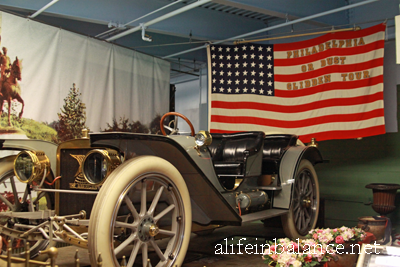 In 1921 an American driver won with the Duesenberg race car. It wasn’t until 1966 that the American car company Ford won with their GT40 MkII, similar to the one at the Simeone Museum. 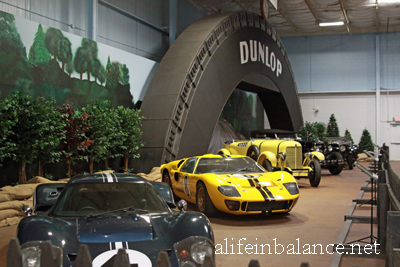 NASCAR racing is well represented at the Simeone Museum in their Sporty Car Annex. Here you’ll find a 1938 Ford Coupe, a car driven by the first female NASCAR driver, along with other famous cars from NASCAR history. Fans of the Cars movies will be thrilled to see a 1953 Hudson Hornet.